As a Windows and frequently internet user, you probably deal with lots of passwords every day. Remembering each set of login details and typing them in can be time consuming and very frustrating. 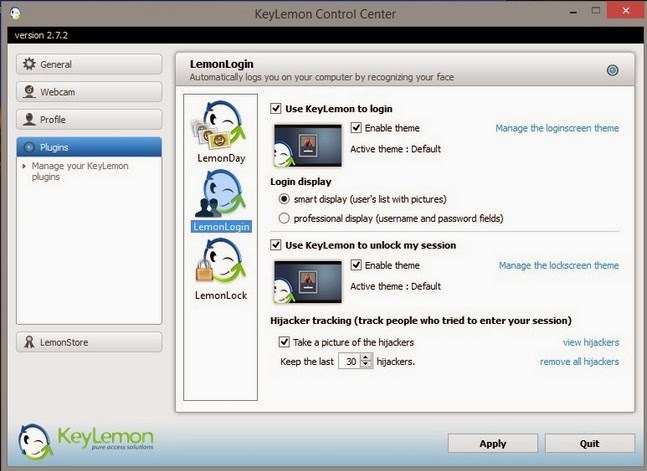 KeyLemon is a simple solution to log on to your personal Windows account by using your face. If you computer has multiple users the software automatically logs you into the right Windows account. When you leave the computer, it will automatically lock it and then unlock it when you are back. KeyLemon works as a password manager for popular internet sites. When you connect to a website (Facebook, Twitter and / or LinkedIn), KeyLemon automatically logs you into your account by using your face. 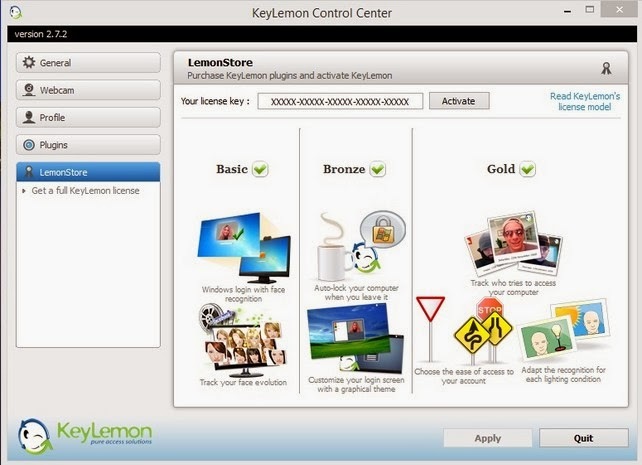 KeyLemon changes the way you log in to your computer. Experience a new way to login by face recognition instead of typing your username and password. It replaces the standard Windows XP / Vista /Seven logon screen with a KeyLemon login screen that connects to your webcam. You are not recognized and identified? No problem, you can still log manually or switch back to the standard Windows interface. Your computer is connected to a domain? No problem, KeyLemon supports domain user and identification. If you want to you can have fun by customising your welcome screen with your own background image or theme. Thanks to face recognition technology KeyLemon ensures computer access to authorized users only. Fancy a coffee? Don’t worry, KeyLemon permanent protection will automatically lock Windows when leave and unlock it as soon as you return. It is a simple, fun and convenient application to lock and unlock your session using your face and a webcam. Choose the ease of access to your computer, balancing the security and convenience that you want. The recognition accuracy can be chosen between “low”, “medium” and “high”. In parallel, you can enable a spoof detection to avoid unwanted access by classical spoofing methods (access with a photo of you for example).